A San Diego police motorcycle officer suffered broken bones in a motorcycle crash Tuesday on the 805 Freeway in University City. 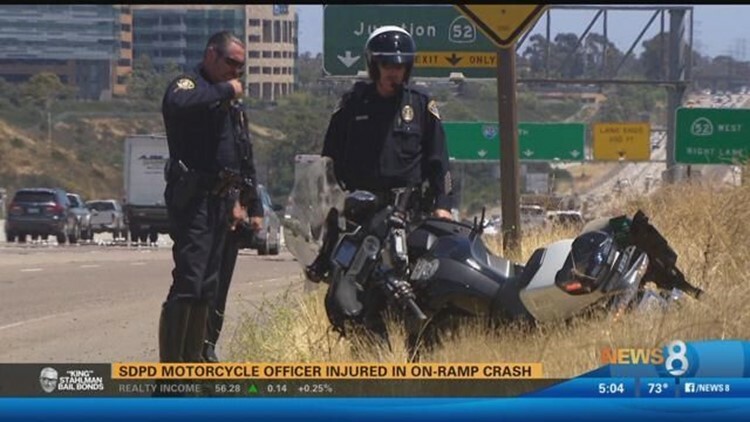 SAN DIEGO (NEWS 8/CNS) - A San Diego police motorcycle officer suffered broken bones in a motorcycle crash Tuesday on the 805 Freeway in University City. The single-vehicle accident happened shortly after 1:30 p.m. in the southbound lanes of the freeway at Governor Drive, SDPD Officer Billy Hernandez said. The CHP says the officer somehow went too wide off the roadway and hit a metering light. The officer was taken to Scripps Memorial Hospital with a broken shoulder blade and fractured ribs, Hernandez said. The right lane of the freeway was closed for about one hour, but the on-ramp from Governor Drive to the southbound 805 remained closed as of mid- afternoon, according to the California Highway Patrol.